Go for it, you gotta set the pace and work. Okay, a line from a song I like. From a strange movie I like. (shrugs). Anyway, in keeping with our newly found 2011 Tradition of having absolutely no money whatsoever in the budget for projects (or gas or cars or clothes or…) we are working on things that require elbow grease and not much else…so, “work”. It’s good for me, good for our projects, and I enjoy the work anyway. So, this weekend it was a bit of destruction in our commercial building on the square. 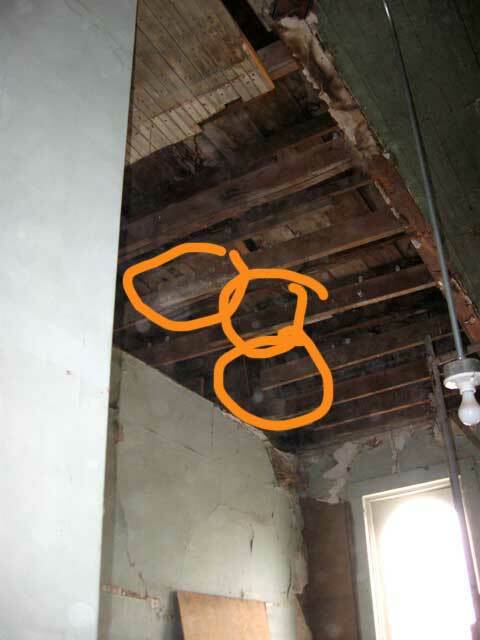 One of the front rooms has a beadboard ceiling that had a dip/sag in it that was severe enough to pop the beadboard off. 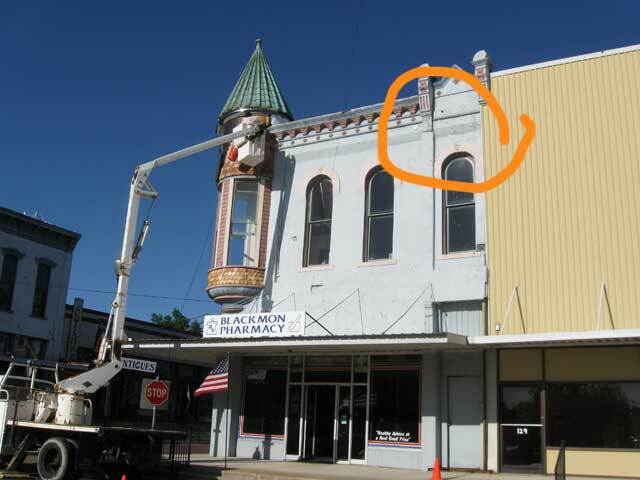 It was in the front corner of the room, and since the attached building next door to me lost part of their facade (the building covered in metal in the pic below) I figured we had something structural going on there. The damaged ceiling is in the front corner of the room, right above that window. The fifteen foot ceilings make working on them a bit tough, so, me and my dad hauled the scaffolding upstairs (that’s a job in itself!) and set it up. Four frames, four cross supports, four wheels, and four platforms…up the stairs, which are at the VERY back of the building, and haul them to the front. Worth it though. Scaffolding makes high work just challenging, instead of dangerous. 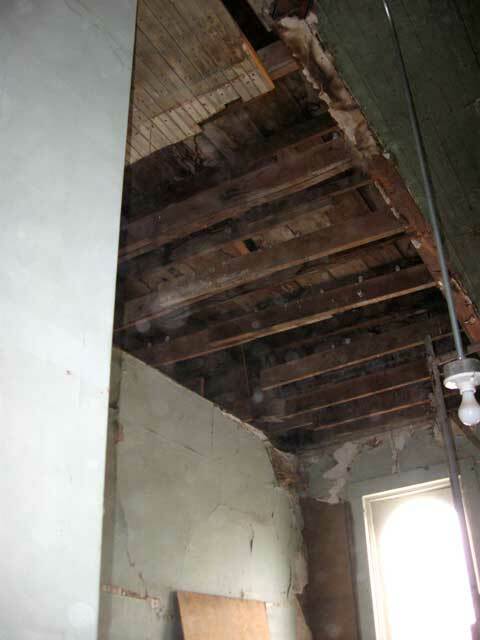 Once set up, we then removed the damaged ceiling. Good news! Well, sorta…I’ve still got to fix stuff, but it’s pretty easy to fix. Turns out somebody moved a wall many years ago (50 or more probably). The wall was support for a split in the trusses holding up the roof. Without support, several of them sagged. The good news is it’s cheap to fix, and not complicated. Lots of work, but that’s just elbow grease. Note the almost sort-of but not, cribbed together trusses. An easy, and uncomplicated fix.